Time flies... It seems I have more things to do, and less time to do them! Am I getting slower? Whatever the answer to this question might be, we are again welcoming you to the Stamptacular Sunday Challenge, with a totally blue theme! Blue Blue Christmas. For my card, I chose Tilda in Winter light and created a scene in which she would be waiting for Santa! 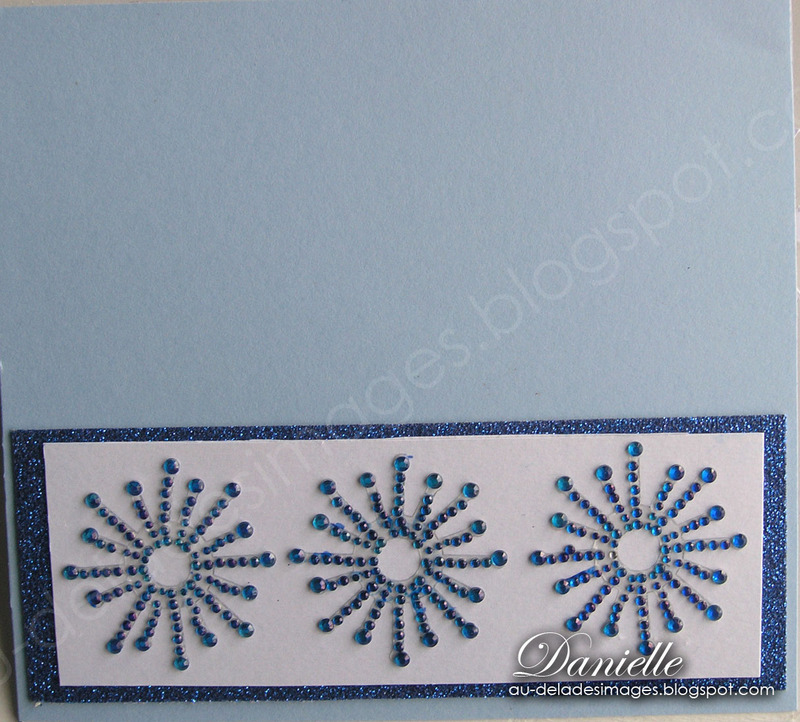 I used ACCardstock glitter in blue, along with a Creative Memories past Christmas collection. I colored Tilda with copics, on Cryogen White paper, and added Frosted Lace Stickels on the borders of her coat. Although it doesn't show on the picture, the lantern glasses are acetate with alcool ink to create a light effect. The little wall is also a Magnolia stamp. I separated the wonderful #568 Winter forest stamp to create a 3D effect. I started painting the trees with SU Ink, Always artichoke and Night of navy; then I created the snow effect with Liquid Applique, when it was completly dry, I added Crystal Stickels. The lovely bow is made out of this gorgeous Pierre Belvedere ribbon; I had no blue flowers, nor appropriate decorations for my card... So, I created stickpins. I had "nails" that are used when making jewelry, although the end is not sharp and I don't have a clasp, I simply cut the part I did not need. The stones are also from my stash, as well as the little wire I made springs with. The leaves were cut with the cuttlebug Dove of peace die. The sentiment is a Magenta stamp, as well as the Santa and the inside greeting. I cut the label with the Spellbinder Fancy Tags labels. The lovely snowflakes on the inside are really laptop decorations! I thought they were so nice, I bought them anyway. I changed the shade of blue with my copics, as they are originally aqua. Thank you for taking time to visit my blog. Hope you will join us this week at Stamptacular, our sponsor are Simply Betty Stamps and Meljins design. Le temps file à la vitesse d'un TGV, il me semble que les choses à faire s'accumulent et que le temps lui, raccourcit! Peut-être que je ralentis... Quelque soit la réponse à cette question, nous sommes déjà dimanche, et c'est à nouveau notre rendez-vous Stamptacular; notre thème cette semaine est "Noël bleu". J'ai choisi Tilda in Winter Light pour qui je voulais créer une petite scène. Tilda attends donc le Père Noël! J'ai utilisé du carton brillant de AC Cardstock; les papiers sont d'une collection antérieure de Creative Memories. J,ai colorié Tilda avec les Copics, sur papier Cryogen White, j'ai ajouté des Stickles Frosted Lace pour créer l'effet de fourrure. Les vitres de la petite lanterne sont un acétate colorié aux encres à l'alcool. J'ai séparé les arbres de la magnifique étampe Winter Forest pour créer un effet 3d. Les sapins sont peints avec de l'encre Stampin Up, Artichaut toujours, et Bleu nuit. Pour la neige, j'ai utilisé du Liquid appliqué, sur lequel j'ai ajouté des Stickels Crystal, une fois bien séché.Le muret est une étampe Magnolia. La boucle, c'est le ruban blanc/bleu de Pierre Belvedere que j'ai choisi, et comme je n'avais pas de fleurs ou autres décorations adéquates, je les ai faites! J'ai pris un long clou (ceux que l'on utilise dans la confection des bijoux) pour imiter une épingle à chapeau! Les pierres sont de mon inventaire tout comme le fil pour fabriquer les petits ressorts. Les feuilles sont coupées avec Dove of peace de Cuttlebug. Le sentiment est une étampe de Magenta, tout comme le Père Noël et les voeux de l'intérieur de la carte. J'ai coupé l'étiquette avec le Spellbinder Fancy Tag. Les jolis flocons à l'intérieur sont en réalité des décorations pour laptop! Je le ai colorié avec les copics puisqu'ils sont de couleurs aqua.Merci de prendre le temps de venir me visiter. J'espère que vous participerai en grand nombre à ce défi Noël bleu. Les commenditaires sont Simply Betty Stamps et Meljin's designs. J'ai décidé d'aller attendre le Père Noël avec ta Tilda. Elle semble avoir beaucoup de patience et moi j'en manque ces temps ci. Trève de plaisanterie, cette carte est super géniale comme toujours. J'adore les couleurs utilisées et le montage que tu as créé pour ta Tilda. Bravo en passant cette Tilda est super. Tu as vraiment choisi un très beau fond pour cette mise en scène...qu'on croirait presque réelle!! 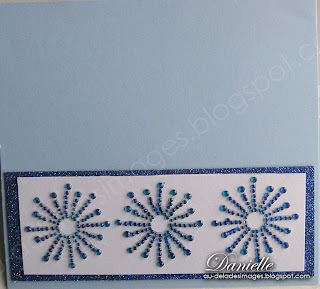 OMG, Danielle, I love the wonderful blue scene you created...absolutely MAGNIFICENT!!! This adorable Tilda is colored to perfection. I just colored those trees yesterday, using liquid applique for the snow because I couldn't find my polar ice flower soft. It's hiding somewhere in my craft room!!! !What a clever idea using the acetate w/alcohol inks for the lantern!!! Stunning details and I love the glitter! Danielle!!! Maravilhoooooooooso!!! são as únicas palavras que encontrei para me expressar. Very lovely. All the sparkly glitter on the trees and stone, great color, love Santa flying off in the distance on the edge of the card. Tilda is sitting in the light of the full moon with all its glow. Ok, first WELCOME BACK! I've missed you!!!! Second, WOW WOW WOW!!!! This image is STUNNING! Just amazing Danielle! I LOVE this Danielle! You have created an absolutely gorgeous scene. I love that Santa is flying in the background. Just fabulous! Gorgeous card Danielle. How clever to arrange the wall and tree together for the background. Love all the texture and the beautiful Tilda with lantern is looking very sweet!! Wow, this snow scene is AWESOME!! Beautiful card!! Très belle carte avec tout les petits détails. J`aime bien la couleur bleu, ca nous change du rouge. oh la la c'est beau! Oh Danielle, this card is gorgeous! I love the blue and white and your combination of Magnolia images!! Beautiful coloring and design! so creative. a real special card. Hey Danielle -- I thought I had commented on this lovely card -- This is so very pretty and the Santa flying through the sky gives a touch of whimsy. The trees are wonderful and so is the bow. Hey anything with French on it has to be outstanding! Danni! This is wonderful! I love the three images you combines and the awesome coloring job. I love the snowflakes you made! I love how you've finished the inside...gorgeous work! so pretty Danielle! What a delightful and creative scene! Brrrr....it looks cold! : ) TFS! Hi Danielle...WOW! This is soooooo pretty! I love the scene you created...just such fun. Tilda looks so cold sitting on that stone wall...so glad she has her cozy clothes on!! Love the colors and your DPs are perfect!! Que de travail dans cette carte et tellement jolie!!! Moi qui adore les Tilda, tu es venue me chercher avec celle-ci! BRAVO!!! Danielle, I the your color of your card and the design.. The Tilda you chose to sit on the brick wall with the trees are so gorgeous and your coloring is devine.. love your ribbon and especially love Santa way off in the background.. a beautiful card. Danielle ta carte est simplement magnifique. J'adore les couleurs utilisées et ton montage est tout à fait génial. What a gorgeous card! I love the way you used Liquid Applique and Stickles together. Everything is colored so beautifully. Great job! WOW! This is absolutely gorgeous! Beautiful coloring, I love the scene you created. Wow Danielle! Such a stunning card! I love all the snow accents! Just beautiful! Wow Danielle, this is gorgeous!!! It is so beautiful! Your card is a stunner. I love how you added the acetate to the lantern, such a great detail. The glitter and bling is gorgeous. I hope your mom is feeling better. I'm way behind on my emails! Oh my goodness!!! This is absolutely AMAZING! I love your colouring and your scene is truly STUNNING! Wow! I love it! It seems all your creations are just adorable. You've created a beautiful scene here. Tilda looks great, but those trees are just magnificent! Wonderful colors and lovely bow too. PS J'adore le nom de ton blog!